Fear is one of the biggest things that stops men from having the success and intimacy they want. Becoming fearless is a far fetched goal, so it’s important to figure out how to move through fear when it shows up. 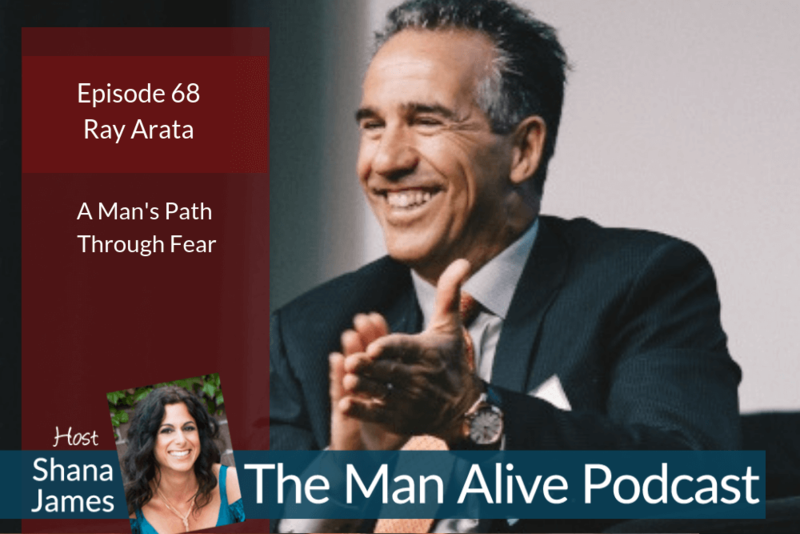 This conversation with Ray Arata shows you how. Men tell me they think they have to get over fear in order to be powerful. I help them feel less afraid and more confident but I also remind them that fear doesn’t fully go away. In fact, fear can be a guide, showing you what matters to you, or what your next step is to grow and mature. Sometimes fear isn’t even what it seems! Fifteen years ago, in the midst of workshop I was learning to facilitate, I learned an important lesson about fear. I witnessed a man expressing loud, intense sounds — grunting and stomping around the room. My dad was a quiet peacemaker type so at that point I hadn’t been close to a man in that kind of powerful, primal expression. As he got louder I felt more and more anxious, to the point where I thought I would explode. I ran outside and found my mentor there. He looked at me with a slightly amused look on his face. I started to open my mouth to argue but stopped. I paused to check in with my body. When I took a breath and allowed the sensations, without getting caught in my mind’s story, I realized I didn’t feel bad. I just felt A LOT of sensation. I suddenly saw that it was more aliveness than I was used to and an internal alarm had been activated. Danger danger, too much sensation! After a few moments of breathing deeper I was shocked to find I was found the experience pleasurable! Sometimes the path through fear is simply recognizing there is too much life force (or energy) for the small space your body is containing it within. Other times the path is finding the emotions the fear is covering over. Whatever the case, it can create even more fear to explore this alone. Also, Ray created a conference — the Better Man Conference — that provides men with resources, support and community to create an inclusive culture. This year it’s in SF and NY. I will attend the SF conference and would love for you to join me. He is generously offering discount for the Man Alive community. The link and discount code are below. Ray Arata is a California-based integrative leadership coach, inclusion consultant and cultural facilitator. Ray’s personal mission involves going into the corporate world and getting male executives to stand up and stand strong when it comes to including and advancing women. Ray brings his passion for working with men to the very relevant topic of enlisting the engagement of men to support gender equality. With over 10,000 hours of men’s personal leadership work under his belt, having led transformational workshops and men’s groups, and coaching men, Ray brings a unique and much needed experiential point of view that supports organizations in meeting men where they are and guiding them on an inclusionary leadership journey where women, the organization, and men all win. As a co-founder of Gender Leadership Group, Ray is committed to the transformation of the gender perspective from which organizations engage with all stakeholder groups: customers, employees, investors, partners and the global community.